Can using CBD products cost someone their job? While cities like New York have cracked down on CBD in food and drinks, that is not case in Kansas City. But how much of it people consume is important and could have an impact on whether or not they land their next job. KANSAS CITY — While cities like New York have cracked down on CBD in food and drinks, that is not case everywhere. But how much of it people consume is important and could have an impact on whether or not they land their next job. "That's honestly the number one question we get asked is 'will I fail a drug test?' " said Trevor Burdett, owner of Sacred Leaf Zero , a company that grows and extracts CBD without any of the THC. "It's not going to give you the euphoric feeling that a lot of people associate with marijuana, you're just going to get an overall relaxation," Burdett said. The popularity over CBD is booming. Aaron Day just opened up Ron Ron's CBD + Shop on Highway 7 in Lee's Summit, Missouri, to fulfill the demand. "We've been having a real big need for it in this area, a lot of people have been stopping before we even opened and asking 'Hey, are you guys opened yet?' " Day told KSHB. Burdett guarantees their products are THC-free. But there are some CBD products that can contain up to three-tenths of a percent. Experts say the levels are low enough that they would not show up on a drug test. 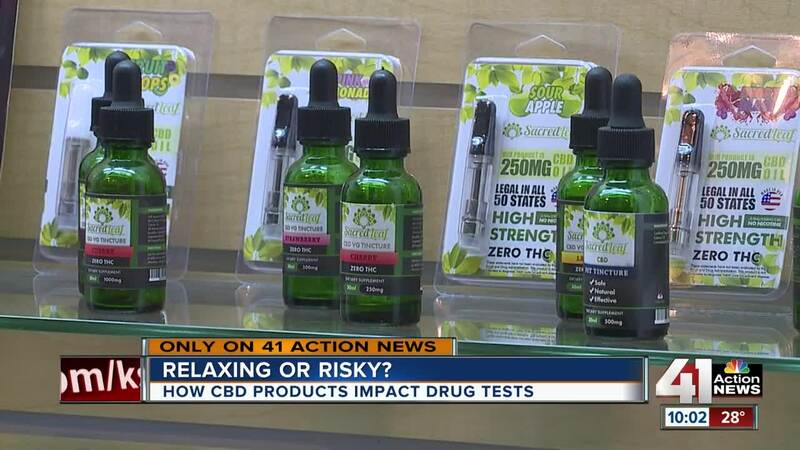 "If the CBD product contains THC at a sufficiently high concentration, it is possible, depending on usage patterns, that the use of these products could cause a positive urine drug test result." Burdett's company provides lab results for all of their products to calm customers. "You know for people that are looking for the relief, but have a job where they are making $80,000 to $100,000 a year, that they're supporting their family, I understand the concern. This is why I've spent a majority of my time building the product that we have to make sure that we're not going to put anybody in that situation," Burdett said. The government does not regulate CBD products at this time, ultimately leaving it up to the consumer to use at their discretion.